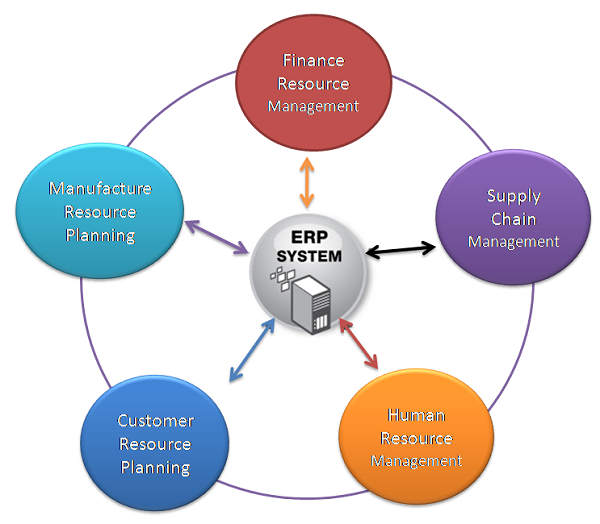 Enterprise Resource Planning (ERP), the business suite, is all about ‘Man, Machine, Material and Money.’ It helps enterprises arrange, plan, implement, run, monitor and utilise their resources effectively. Companies use the system to connect their various business activities across different departments to ensure that every employee is using the same work procedure and accessing the same data. It is one way of bringing about a time-saving, organised way of work, and enhancing the overall productivity of the corporate. Such a system also helps in automating organisational operations, which, in turn, dismisses the high costs of employing labour, and speeds up the processes. However, when it comes to actually implementing an ERP system in an organisation, the needs may vary depending on the purpose of the business. For instance, if a business is all about manufacturing and selling a certain product, it should implement an effective supply chain management system within its organisation. Whatever is the purpose, it is thus, important to have a clear idea of the five ‘components’ of Enterprise Resource Planning systems. At the heart of an Enterprise Resource Planning system is present, the sets of financial units of an organisation. This includes the general ledger of all financial transactions that have taken place in a company, all the accounts that are receivable and payable, billing of the company, and the process of fixed accounts management. To implement the system for managing an organisation’s finances, multiple currencies and languages have to be supported. Moreover, the company has to comply with the regulatory authorities of the nation, too. Other than that, there also are aspects like budgets, expense, tax reporting and most importantly, cash-flow, which demand the implementation of strategic plans in an organisation. This is helpful, especially if you are running a manufacturer company. Also know as logistics, SCM primarily focuses on improving the supply of materials in an organisation. It assists in managing the process via planning, scheduling, procurement and fulfilment. The motive is to enhance customer satisfaction and maximise profitability. Other than these modules, there also are involved, various other sub-modules, which include forecasting, product scheduling, distribution management, demand management, inventory management, warehouse management, and lastly, procurement and order management. An Enterprise Resource Planning system for HR management enables organisations to keep a track of the hours an employee has dedicated to it, and also evaluate his performance. This is a centralised system, which has a number of administration benefits. Most of all, it helps in identifying talents and developing the team overall. The focus of such a system is to enrich an employee’s work experience. Accordingly, it involves payroll management, performance management, bonus and benefits, employee time tracking, workforce planning and compensation, if need be. Features that let employers and employees maintain daily attendance, opt for company benefits, and manage Paid Time Off, are vital parts of such systems. Also known as customer relationship management, it is an approach to manage an organisation’s interaction with its present clientele and future customers. This component focuses on the review provided by customers and helps in the management of pipeline activities of marketing and sales. The data procured via the implementation of such this component lets an organisation learn about client need and how to keep its customers satisfied. It also helps in assessing the area of a business in which marketing efforts have been most rewarding. Such a system makes use of technology to manage, sync, and automate sales, product marketing, customer service process, and not to forget, the technical support to them. This component helps an organisation in streamlining a company’s demand and supply levels. It is a way of knowing whether a company is achieving its targets. The modules that it includes, assist in making relevant operations better and more effective. There’s product configuration involved along with job costing, and billing related to materials management. Such systems generally include forecasting, material requirement planning, capacity requirement planning, master production schedule, work order management, and shop floor control. How can such systems be availed? ERP software for an organisation can be purchased as an integrated, comprehensive suite, or as a specific suite that focuses mainly on one single purpose. The software are also available as a whole, and can be customised according to the needs of an industry vertical. And then, it can be a different approach for different organisations. A company can purchase on-prem software and run it in its data centre, or subscribe to a cloud-based service instead. Of course, there are hybrid systems available, too. Whatever be the choice of software, an effective integration between the different modules is the key to a successful Enterprise Resource Planning system. The prime motive should be the formation of an interconnected network amongst the core functions of a company. There should be an easy flow of information to assist in the assessment of organisation-wide outcome. How Search Engine Optimisation Can Rule the Visibility of Travel WebsitesHow to Optimise Your eCommerce Website for Modern Buyers?